Alameda is a treat to explore by bicycle or boat. On Friday evening we peddled out toward then de-commissioned Alameda Air Station. Out near the end of the airstrip and with a great view of San Francisco, we stopped in at Rock Wall Winery to for Kathy to taste a few wines, then peddled toward neighboring Faction Brewing for a pint of 'Something Different IPA' before peddling home before dark. 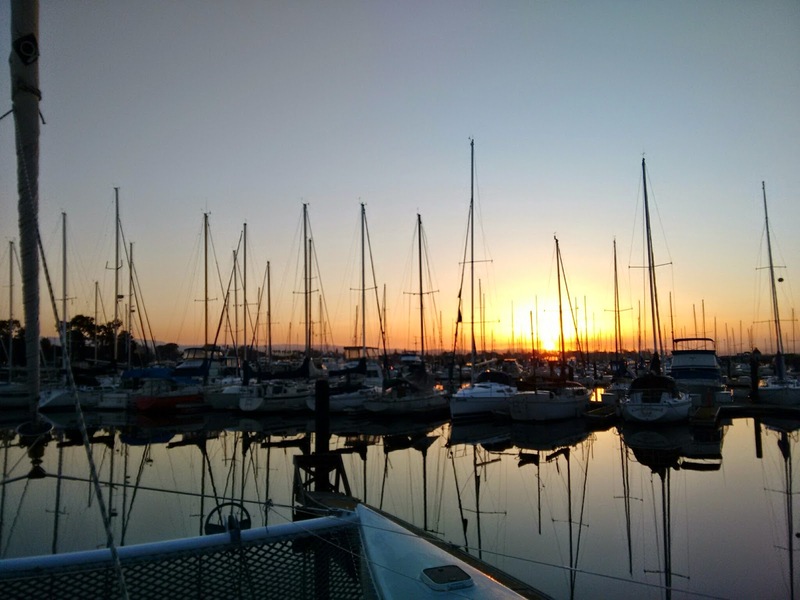 Sunrise over Ballena Bay Marina. Sunset over San Francisco. To right team Atremis foiling catamaran being lifted ashore (think Americas Cup). And then we see this crazy tri coming out of the water. Is it looks like a vehicle to test foils. But where or where is the propulsion unit(s)?